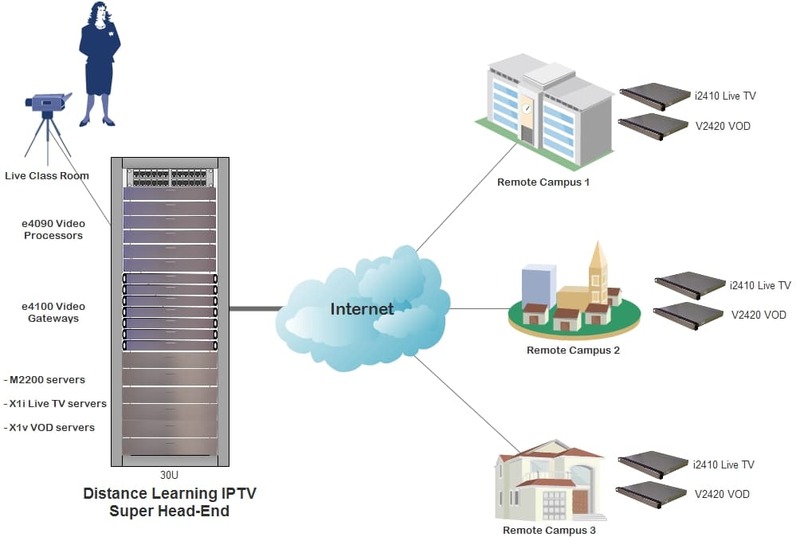 Distance Learning IPTV Solution - MatrixStream Technologies, Inc. Number of Students – Customer would like to support 5,000 students initially. Over time, customer would like a system that can support all 20,000 of its students. Degree Over the Internet – Customer would like to offer working professionals ability to take classes over the Internet regardless of their locations. HD Video – Customer would like to eventually offer all educational videos in HD. Customer would like an IPTV system that can support HD videos. Streaming Over the Internet – Customer has limited budget for network infrastructure upgrades. Therefore, customer has looked at and turned down solutions offered from other vendors that required customer to build an IP network with end-to-end QoS. Customer would like to use the Internet as the transport. View On TV or PC – Customer would like to offer students the option to watch videos on their home TV over the Internet if they elect to get an IP STB. Customer would also to offer students the ability to watch videos using their multimedia desktops or laptops. Remote software/firmware update – Customer would like a system that has minimal truck roll. They would like to remotely manage all the PC and STB clients.Live Video Support – Customer would like to offer live video from 4 different classrooms to stream over the Internet. VOD Support – Customer would like to record each and every class during the semster and make them available for students to watch and review anytime anywhere. Viewing Ratio – Customer anticipates that at any given time, at least 20% of its students will be watch videos whether viewing pre-recorded videos or live teaching sessions. Based on the 5,000 students requirement, the system must support at minimal 1,000 simultaneous SD (Standard Definition) streams. 4 IMX e4010 H.264 video encoders for 4 live class recordings. 2 IMX i2410 IPTV MatrixCast Streaming servers to support live class streaming. 2 IMX v2420 VOD MatrixCast Streaming servers to support all the pre-recorded VOD content. 5,000 MX 3 IP STBs – Fully able to support HD 1080p videos. Students can hook up MX 1 IP STB to their HDTV at home to watch class videos.